Oh dear, now I miss my hens. We had to sell all my laying hens last year when I was away and could not care for them. I had over 40 laying hens and a couple roosters. I bet Henrietta would make a good pet. What breed is Henrietta? She looks like a Buff Orpington! Do you just want good layers or would you like good setters as well? Hahhaaah..cute. Ok how sweet is that to have all those new chick! the chicky in that flower pot is so cute! The muffin top had me laughing! haha! Black Betty has crazy eyes! 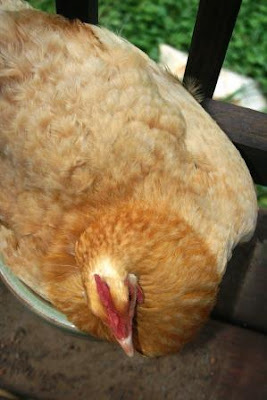 I've never seen a chicken use a pot to lay in...that's funny! She does look like a sweet hen. What a cute post. Henrietta made me smile! 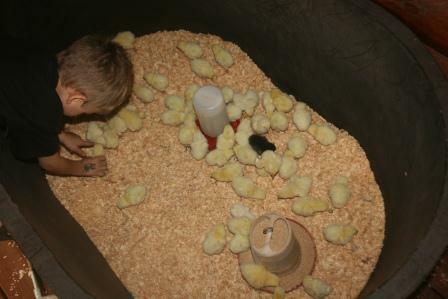 I think I could look at those little chicks for hours. Love the chicken in the pot picture! !!! She's a silly plumpy girl, that Henrietta. But yeah, Black Betty is scary! Black Betty does look rather mean and that "hairdo" doesn't help! LOL!! henrietta is sweet. i want to squeeze her. also. Confession: I am scared of chickens. I used to help my Gramma gather eggs as a kid. I was scared to death! 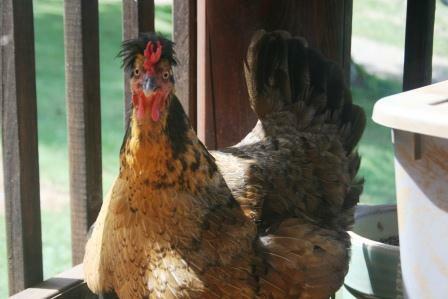 I just knew those chickens were going to get mad as me taking their eggs and peck me til I was unrecognizable. As an adult, those beady little eyes....well, they're scary! LOL! Henrietta just looks sweet. I do like all the speckles Black Betty has. Ha! I may take offense to the muffin top reference...I've been eating too many muffins these days myself :) Beautiful birds! !Henrietta will never be a casserole, how could you eat your friend?! A pettier lady you will never find. Love your chicken update. Muffin top! haha! I wouldn't want to meet Betty in a dark ally...no way..no how! Henrietta is beautiful! Black Betty . . . she looks stern. Love the baby chicks. I would probably get too attached to them. So funny about the muffin top comments ;)...my friend is raising layers for the first time and it is an adventure. 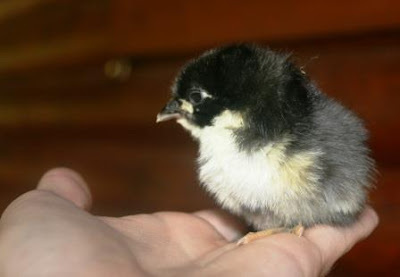 I like those photos with great tenderness in the chick. Your muffin top comment is too cute. At the risk of sounding completely stupid: what's a layer? I miss having chickens. Maybe soon I will take on the project of building a chicken coop. Love the chicken in a too small pot! Black Betty looks a bit demented. What a special little chick. And Henrietta looks very sofisticated sitting on that pot. ok - hilarious about the 'muffin top' chicken in the pot. that is soooooooo funny! Boost on the 'fence quail' is definitely nice. I just still can't believe I got the pic in the first place. Love your chicken update. Do you slaughter your own meat chickens? I have a friend who just slaughtered 180 chickens and I bought 12 from her. Can't wait to be cooking them up soon. Thanks for coming by. I love your hens, especially Henrietta in that pot. Very cute. Too cute... chick in a pot! LOL glad you didn't make a muffin top comment. The chicks are adorable. I just had to laugh at Black Betty, her face is too cute! Hi Fellow Photo Meme participant, Just a quick note to let you know that starting tomorrow, I will begin hosting a new photo meme on my blog. Please come join me at "Orange You Glad It's Friday", and post a photo displaying a little or a lot of orange, my favorite color! Hope to see you there! This was too funny...Black Betty indeed! Some of those hens look like they have too much fluff for the perch they've chosen -smile-. I'm so grateful others have chickens...so I don't have to -LOL-. 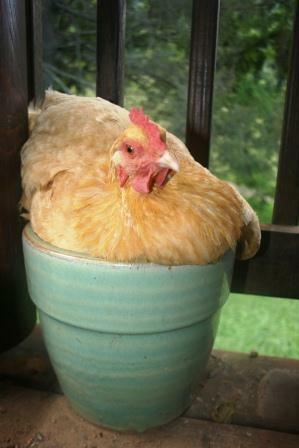 the chickie in the flower pot- we like. Hahahaha, such personalities on these chickens - nicely captured. I think I'm a little afraid of that mean one. Thanks for starting my day with a chuckle! A chicken post! Livie and I have missed reading about (and seeing photos of) your chickens! You are bringing back some memories for me with this post. Sorry, but they are not pleasent ones for me. I do find chicks cute and playful and love having the eggs hens produce. But don't really care for the meat birds. Taking care of the chickens was my job all through high school. I also had to butcher and pluck three or more every Saturday for our Sunday dinner. I have done my best not to eat chicken since leaving home. Apologize if this was TMI.